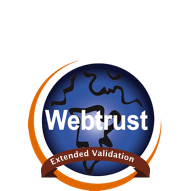 A Digital Certificate reliably asserts the identity of an object, thanks to cryptographic keys used for electronic signature. 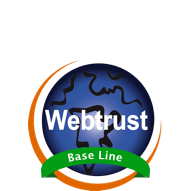 The certificate is issued and signed by a Certificate Authority (CA) such as WISeKey. A legitimate cartridge, tagged with a combination of certificate and tamper resistant chip, can be authenticated throughout its lifecycle. 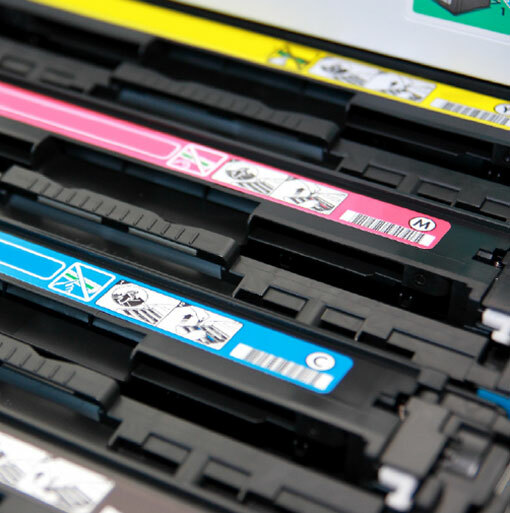 Counterfeit cartridges cannot replicate the cryptographic keys and can easily be detected and blocked from connecting to the printer. This is made possible by the centralized PKI system. 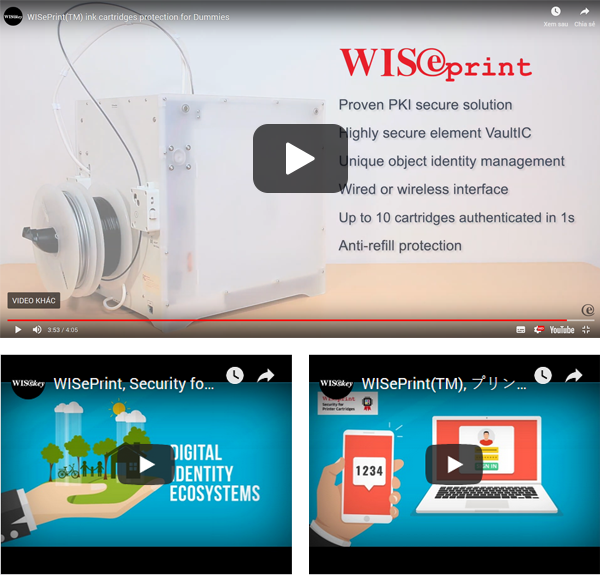 WISeKey is a proven provider of managed Public Key Infrastructure (PKI) services, offering both trusted and vendor-specific Certificate Authority (CA) options tailored to the high volume and reliability requirements of connected objects manufacturers.  As trusted operator of the International Organization for the Security of Electronic Transaction (OISTE) Global Root, WISeKey combines highly-scalable PKI operations with Swiss neutrality, security and privacy laws. 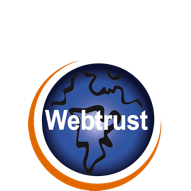 The WISeprint Certificate Management System (CMS) manages the lifecycle of Digital Certificates stored in the tamper resistant VaultIC secure element, providing a cryptographically-protected cartridge eID. 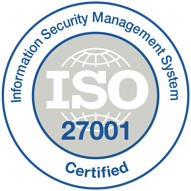 With a user-friendly interface and an easy-to-integrate API, the CMS and its related PKI can be provided as an outsourced service or licensed as a customer dedicated system. The VaultIC secure element comes with a complete firmware dedicated to IP protection and anti-cloning. This firmware uses a variety of cryptographic mechanisms such as digital signature generation/verification to provide a number of data protection and authentication functions. The specific hardware includes a non-volatile and firewalled data storage space for keys, certificates and customer data. 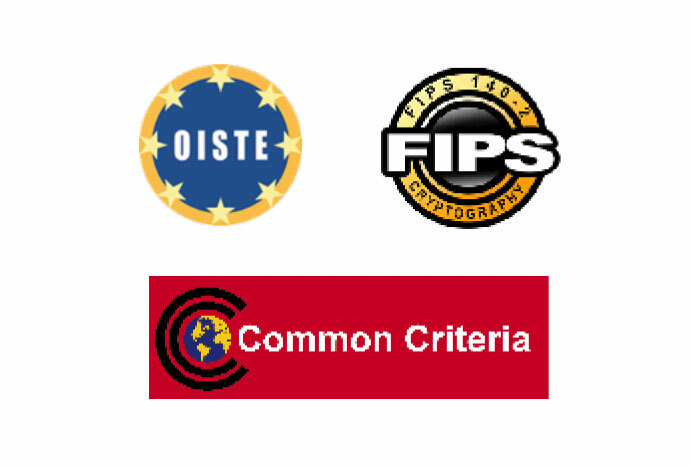 Its large number of security features and a tamper resistant capability offers a full compliance to Common Criteria EAL5+ and FIPS 140-2 Level 3 certifications. Its low-power consumption profile makes it a perfect security companion to a printer host processor. The choice between wired or wireless interface suits any printer configuration. 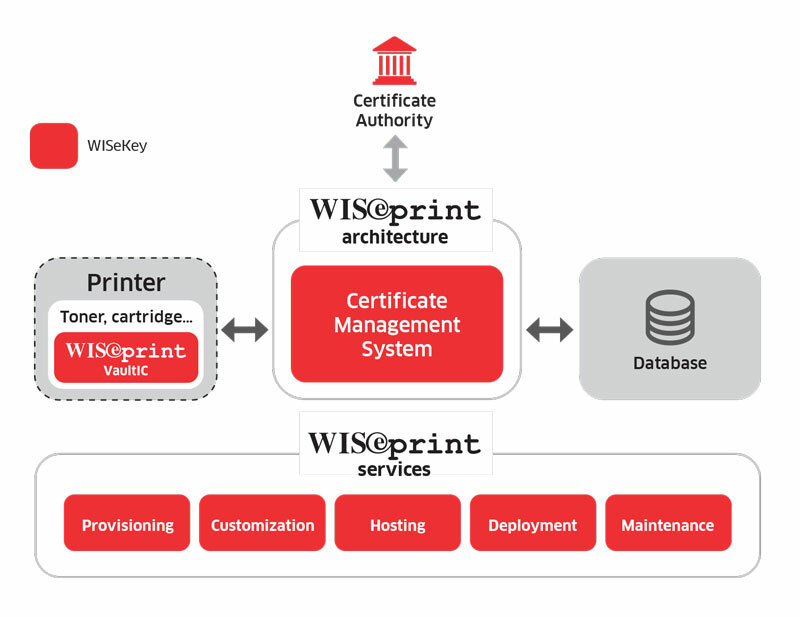 WISeKey provides all the services needed to efficiently deploy WISeprint within a printer manufacturer’s design and manufacturing cycle including provisioning, setup, industrialization hosting and consultancy. 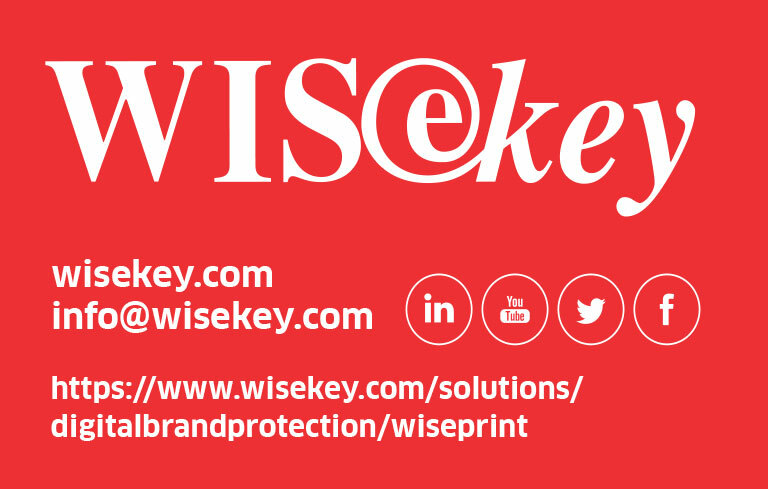 WISeKey CMS can be installed at customer premises, or outsourced to WISeKey and located in one of our regional secure data centers. The application of blockchain in the print industry in conjunction with the Internet of Things (IoT) is gradually gaining pace because of the need for added security and connectivity. Despite the rapid digitization of businesses, especially in media, the print industry is seeing continuous growth. 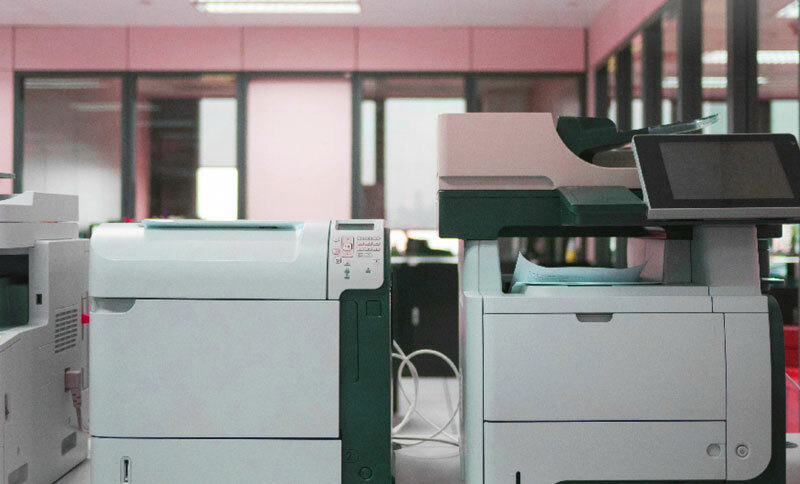 Now, the seamless connectivity and network penetration of IoT is combining with the secure and massive record-keeping ability of blockchain in the print industry. This union is already grabbing the attention of industry leaders like Toppan printing, who along with the IoT company Wisekey, are working to create security tags that enable physical objects to be authenticated online.